One of the most under-rated skills in football is that of the assistant referee, although it may seem to spectators as an easy task. One of the greatest exponents of running the line came to Reading last month to talk to Reading referees. Phil Sharp, who might rightly be called a living lining legend, he has his own page on Wikipedia, ran the line at both the World Cup Final in Japan 2002 and the final of the Olympics football competition two years later. He came to talk about his work with EUFA, when he was asked to provide extra training for assistant referees at EURO 2012 but on the way gave lots of advice on how to run the line. One aspect he mentioned has had several illustrations in recent televised games. Always remember, he said, that when judging offside, you must take into consideration the whole body. This is not Phil Sharp’s own personal ruling on offside. In the ‘Guidelines to Referees’ which appear at the back of the Laws of the Game, it give definitions of offside. In the context of Law 11 – offside, it says that ‘nearer to his opponent’s goal line’ means that any part of the players head, body or feet is nearer to his opponents’ goal line than both the ball and the second-last defender.’ Note that the hands and arms are not included in this definition. The thinking behind this is that you cannot score a goal with your hands. Sounds reasonable, if to my mind a little pedantic but something those running the line have to bear in mind. A few days after Phil Sharp’s talk, Kevin Nolan of West Ham thought he had scored the perfect goal only for it to be ruled out by the assistant referee’s flag. The pundits thought it should have been allowed to stand as it was his arms that were in front of the defensive line and not the rest of his body. The replay showed however that he was leaning forward and therefore his shoulder also was forward of his opponents. It shows just how marginal these decisions can be. Just imagine that you are running the line. There is a free kick awarded to the attacking team and the players, attackers and defenders, all line up across the edge of the penalty area. You get yourself in position looking along the line. The players aren’t going to give you any consideration, so don’t think for a moment that they are going to stand still. Attackers and defenders will be vying for position continually and almost every second the shape of the line changes and you have got to move with it, shuffling sideways constantly to make sure that your view is at right angles across the pitch. You are waiting for the kick to be taken; depending where it is, you may not be looking as much as listening for it so you eyes won’t be deviated at the wrong moment from the line. For it is that moment when the ball is kicked that you have to make your decision, perhaps not with your flag but in your mind, not a second later or a second before. You have seen a flash of white, the colour of the attacking side, move beyond the line. Is it a player’s body or just the sleeve of his shirt? Just consider the level of concentration that is demanded from an assistant referee in that instance alone. 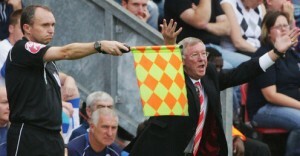 Phil Sharp was pleased that at UEFA 2012, the percentage of correct offsides given by the assistant referees was 98.74%. In the Premier League this is said to be over 99%. If you just take the one small scene that I have illustrated, I think you will agree that those are remarkable figures.